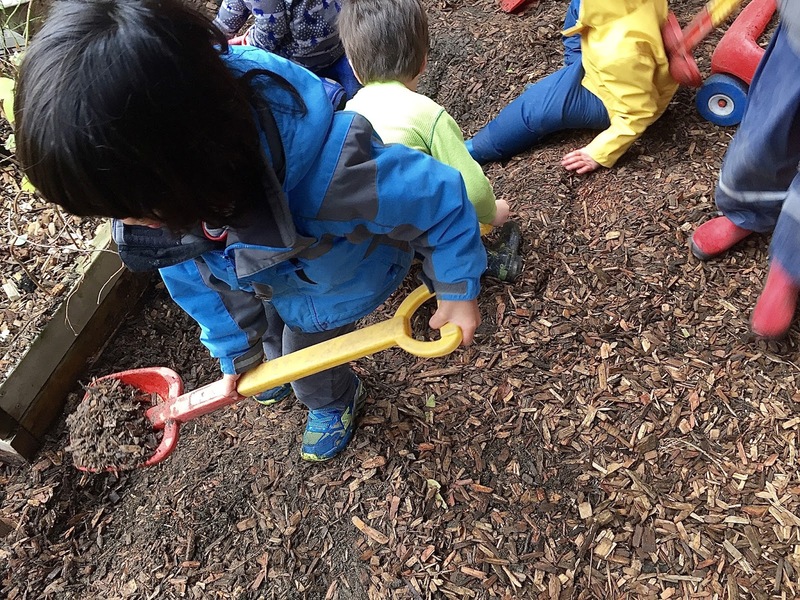 Our playground is built on a sloping piece of land that is about one quarter sand pit, while the rest is covered in a layer of wood chips. As will happen with erosion, both the sand and wood chips migrate from the top of the yard to the bottom. A couple times a year, the adults, as part of our regular work parties, take on the Sisyphusian task of counteracting the results of gravity, weather, and playing children with shovels and wheelbarrows, hauling it all back to the top of the slope again. 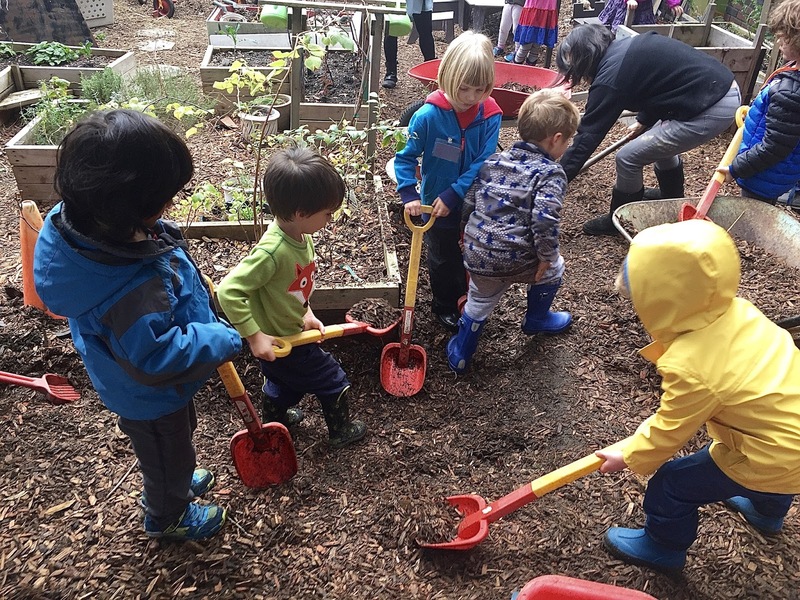 We're between work parties and it's been bugging me that some of our raised planting beds are about to be overwhelmed by wood chips, so I grabbed a shovel and wheelbarrow and started digging as the children in our 4-5's class were arriving. The kindergarteners were already out there playing and their teacher, Teacher Rachel, said, "It looks like Teacher Tom could use some help." 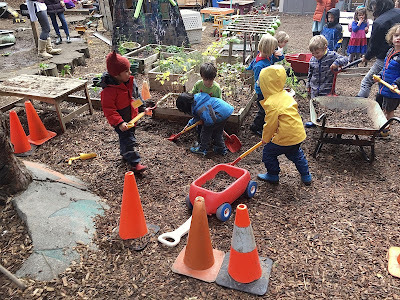 Soon I was surrounded by shovel-wielding five and six-year-olds asking me what I was doing. I showed them that the planting beds on the downhill side of the garden were four boards high, while the one beside which I was digging only had the top board showing above the chips. "There's over a foot of wood chips here that needs to be moved back under the swing set." As a half dozen kids fell to the task of digging, there was no longer much room for me, so I stepped back. Other kids retrieved wagons and other wheeled conveyances and we soon had a line-up of "trucks" waiting to haul our loads. When the kindergarteners were called inside, their places were smoothly filled by a second shift of preschoolers, bending their backs to the task. In the beginning, each newcomer had asked me, "What are you doing?" 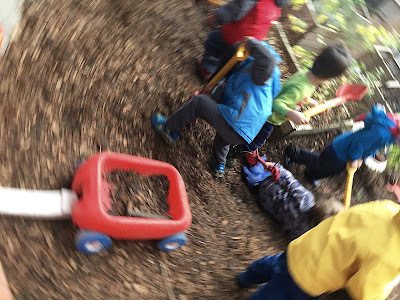 and I had explained, but by now the children were expert enough to answer one another, effectively and efficiently conveying the idea of erosion to their friends, who in turn leapt into the hole to dig. Whenever there was a gap or a lull in the digging, I plunged my shovel blade into the ground and within seconds there were smaller people replacing me. Sometimes we thought we had hit a rock, the ground was so hard, but usually it turned out to just be wood chips mixed with sand that had become compacted. We did unearth two large logs that we had at one time used as benches. We found dozens of "jewels" (florist marbles), and several small toys (like the leg of a plastic elephant). We found that the roots of some of our garden plants (our raspberry bush in particular) had pushed between the planter boards. Occasionally, a kid or two would start goofing around in the hole, but they were quickly and firmly informed, "Hey, we're working here! A couple kids rounded up several of our orange caution cones and created a visual "work zone." I helped out with the wheelbarrow loads, but the kids managed the wagons and smaller carts on their own, dumping them under the swing set. "Remember then: there is only one time that is important -- Now! It is the most important time because it is the only time when we have any power. The most necessary man is he with whom you are . . . and the most important affair is to do him good, because for that purpose alone was man sent into this life!" I had started to dig, the children had seen they could help me, and they did. The rest of eduction -- and society and religion and everything else for that matter -- is mere bells and whistles: this is why we're here. "With Our Ears And Our Hearts"